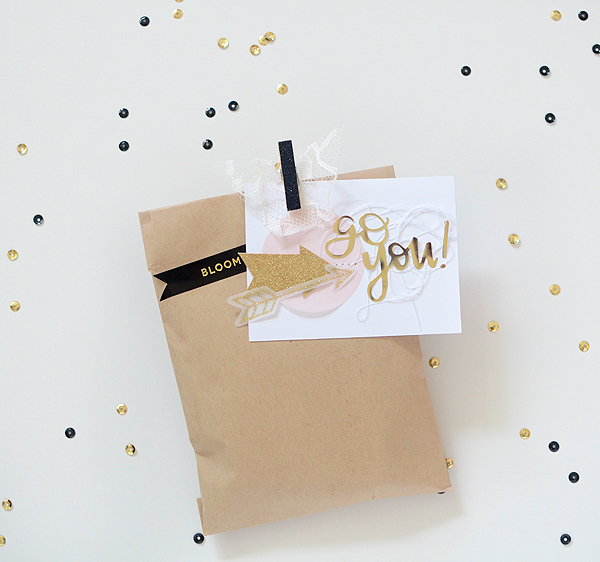 July's kits were full of bright, happy colors that are so perfect for summer. 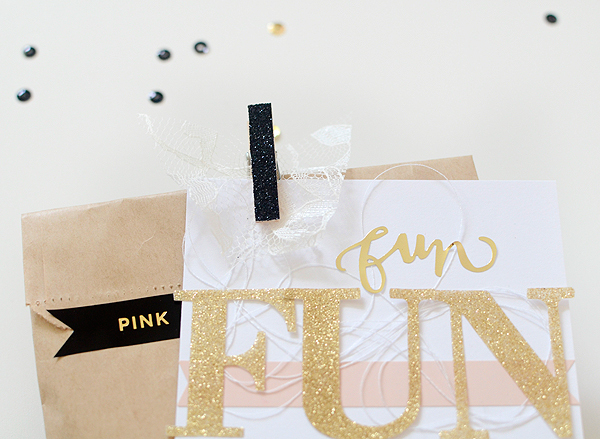 While I loved working with the full spectrum of rainbow hues on my other projects, I just couldn't resist my favorite color palette of blush pink, gold, and a bit of black. 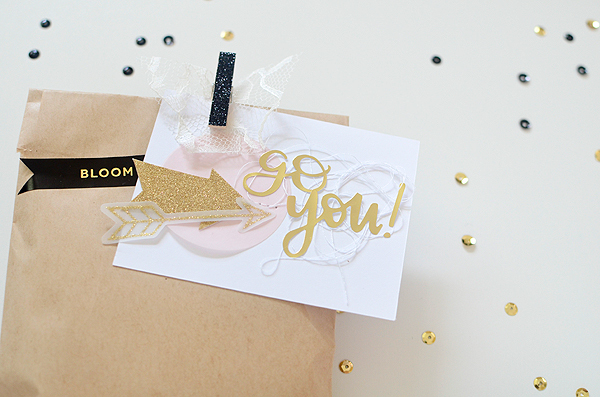 I love projects like these mini cards (they photograph so well, for one! ), but they are a bit of a departure for me, as I tend to gravitate toward softer colors, for some reason. It's always good to step outside your comfort zone and challenge yourself, but admittedly, it was a sweet moment when I was able to break down the kit pieces and isolate the blush pink and gold in the midst of all the bold, primary-esque tones. Hiding amongst the reds, oranges, and blues this month were the slightest bits of pale pink--stickers from Shimelle and vellum circles, both in the Main Kit. 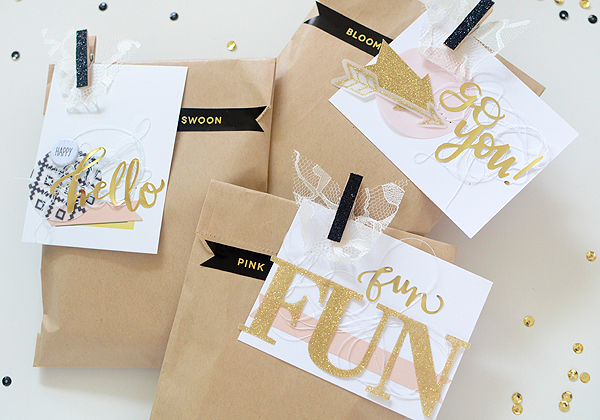 I adore pink and gold as a soft, sweet palette (I hope it's not passé yet), but I also love what happens when you add black to the mix; it's like going from the bridal shower tea to the bachelorette party! 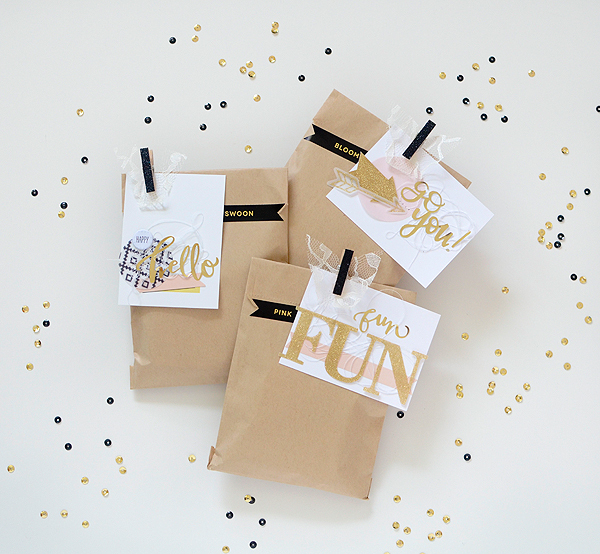 Another thing I'm excited about is that the Life Pages cards now come in these kraft bags because I can always find a way to incorporate them into packaging. 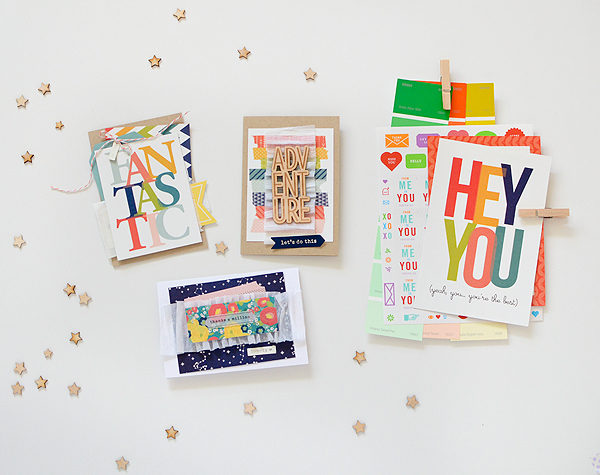 'Happy Hello' was the first card I made and it started when I put a pink sticker over the 'Today's Top Story' card from LP Kit #3. There is a smidge of the spring green showing and a thin black line, both of which I liked for their classic design elements. Initially, these tags were going in an entirely different direction, but as I got into the project and began putting the phrases together, I let the cards and color palette define themselves. 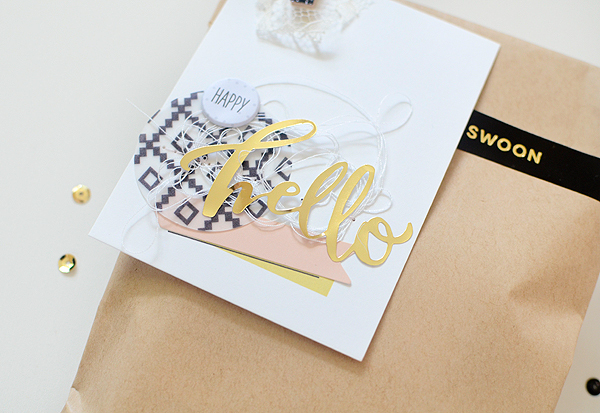 The 'Hello' card went in the direction of layered, trendy, almost geometric, but the ideas and aspects I was trying on the other two cards for that same look weren't working. I was sure I wanted to keep black as a component, though, so I had to find a way to incorporate it elsewhere. 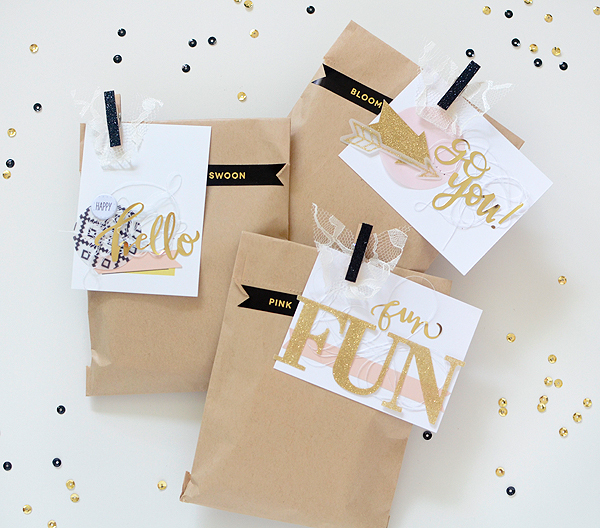 The first thing I did was use black glitter clothespins to secure the tags to each bag. They looked pretty bare, so I tried black twine, black ribbon, and a couple of black and white washi tapes from my stash, none of which I was happy with. 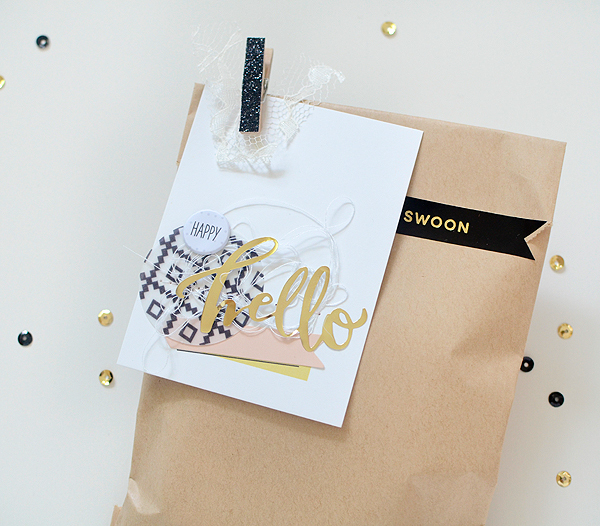 Then I remembered the black and gold labels by Seven Paper and they worked like a dream! They had the edge I wanted and I loved that they were a true black so they really pop against the white cards. They're sticky so they work just as well as tape, too. 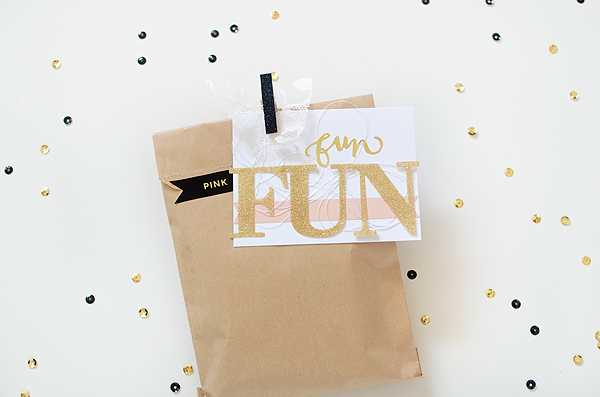 I chose fun phrases and snipped a V out of them, and the packaging was complete. Oh, and a little lace, of course. 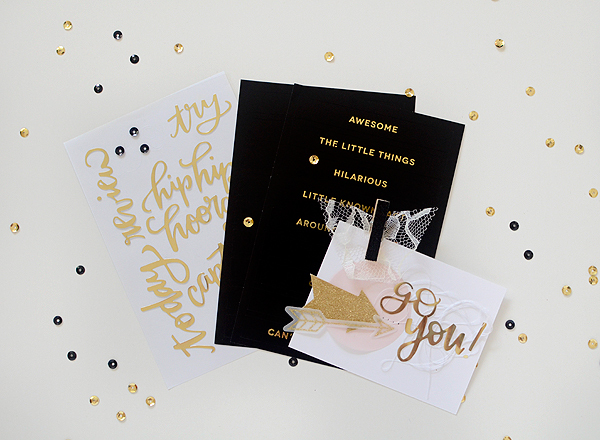 The gold foil stickers (Main Kit), also from Seven Paper, were another facet I used on each card. 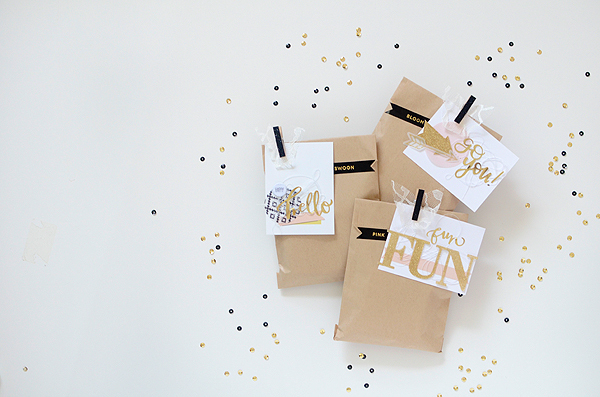 The tags don't have to match exactly, but a few like elements gives the set a cohesive feel. In the July kits, with their full spectrum of colors, I managed to come up with something entirely different (nearly color-less), so it just goes to show that if you look carefully, Gossamer Blue kits have you covered for any situation! LOVE all the gorgeous eye candy!